Woman who ‘text drove’ boyfriend to suicide on trial – Royal Times of Nigeria. A 20-year-old US woman, whose boyfriend took his own life nearly three years ago, has gone on trial for allegedly urging him to kill himself. 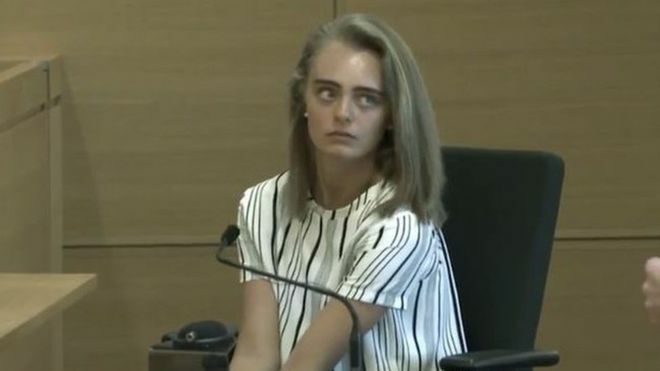 Michelle Carter is charged with involuntary manslaughter for her role in the suicide of Conrad Roy III. Prosecutors allege Ms Carter drove the Massachusetts 18-year-old to his death to attract sympathy. “You need to do it, Conrad,” Ms Carter texted him on the morning of 12 July, according to records presented by the Bristol County District Attorney’s Office. “You’re ready and prepared. All you have to do is turn the generator on and you will be free and happy,” she wrote. As he expressed doubts, she kept pushing. “I thought you wanted to do this. The time is right and you’re ready … just do it babe,” she said. “No more pushing it off. No more waiting,” she went on. Mr Roy was found dead from carbon monoxide poisoning in his vehicle at a Kmart car park in Fairhavens, Massachusetts, on 13 July 2014. Texts show he wavered in his plan to follow through with the suicide, at one point getting out of his pick-up truck. After his death, she fundraised for mental health awareness and led a charity softball event in his honour. Mr Roy’s mother, Lynn Roy, told the court on Tuesday she had no warning of her son’s suicide. On the day of his death, Mr Roy went to the seaside in Westport, Massachusetts, with his mother and sisters, according to prosecutors. He bought his sisters ice cream, joked about bathing suits and spoke of a scholarship he had just won, while making other plans for the future. Ms Carter sent texts to Mrs Roy after her son’s death, telling her that his spirit lived on.